The find could tell us more about how planets die. A planetary fragment orbits the white dwarf SDSS J122859.93+104032.9, leaving a tail of gas in its wake. Astronomers have spotted a decent-size object in the disk of dusty debris surrounding a superdense stellar corpse known as a white dwarf, a new study reports. The newfound "planetesimal" is likely part of a world destroyed during the star's death throes, study team members said. And the fragment's incredibly tight orbit — it zips around the white dwarf once every 123 minutes — suggests that the chunk may even be a piece of the shattered planet's core. "The planetesimal we have discovered is deep into the gravitational well of the white dwarf, much closer to it than we would expect to find anything still alive," study co-author Boris Gaensicke, a physics professor at the University of Warwick in England, said in a statement. "If it was pure iron, it could survive where it lives now, but equally it could be a body that is rich in iron but with internal strength to hold it together, which is consistent with the planetesimal being a fairly massive fragment of a planet core," Gaensicke added. "If [this idea is] correct, the original body was at least hundreds of kilometers in diameter, because it is only at that point planets begin to differentiate — like oil on water — and have heavier elements sink to form a metallic core." Most stars in the Milky Way galaxy, including our own sun, will eventually collapse into white dwarfs after they burn through all of their nuclear fuel. If such stars are big enough initially, they'll get to this endpoint after passing through a "red giant" phase, in which they bloat to tremendous sizes. The new study, which was published online today (April 4) in the journal Science, was led by Christopher Manser, a physics research fellow at the University of Warwick. Manser and his team investigated a white dwarf known as SDSS J122859.93+104032.9, which lies about 410 light-years from our solar system. This exotic object packs 70 percent of the mass of the sun into a sphere about the size of Earth. The researchers looked at the white dwarf system using one of the largest telescopes on Earth: the 34.1-foot (10.4 meters) Gran Telescopio Canarias (GTC), located on the Spanish island of La Palma off the northwestern coast of Africa. Specifically, they analyzed gas emission lines in the disk, which revealed the presence of a planetesimal zipping around the dead star every 2 hours. Manser and his colleagues determined that the orbiting object is probably less than 370 miles (600 km) wide, with a density of between 7.7 and 39 grams per cubic centimeter; otherwise, it would have been ripped apart by the white dwarf's gravity. This density range "is compatible with that of pure iron and of Earth's core," Luca Fossati, a scientist at the Austrian Academy of Sciences' Space Research Institute in Graz, wrote in a companion "Perspectives" piece in the same issue of Science. "It is therefore plausible that the planetesimal is the remnant core of a shattered planet," added Fossati, who is not part of the research team. The surprising survival of this fragment may force a rethink about how white dwarfs chew up their planetary offspring, Manser said. "The tidal disruption process has for the most part been modeled fairly simply, as it is assumed that everything is torn apart when it gets close enough to the white dwarf and forms a disk, and this study shows that we need to consider this process in more detail," he told Space.com via email. The other find was made in 2015 by NASA's planet-hunting Kepler space telescope using the "transit method," which looks for dips in brightness caused when orbiting objects cross a star's face. The transit method requires a precise cosmic geometry; the target star and its orbiting objects must be aligned precisely with the observing telescope. 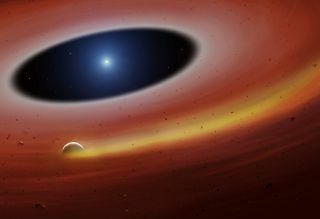 But the spectroscopic technique employed by Manser and his team makes no such demands and may therefore allow astronomers to find many more planetary shards around white dwarfs in the future, Fossati noted. The chances will be especially high when huge ground-based instruments — such as the Giant Magellan Telescope, the Thirty Meter Telescope and the Extremely Large Telescope — come online in the mid-2020s, he wrote. But Manser doesn't plan to sit on his hands until then. "There are already six other [known] systems that have gaseous emission like that at SDSSJ1228+1040, which we are hoping to observe in the near future," Manser said, stressing that the team plans to use currently operational scopes such as the GTC.